Studies like this are dime a dozen. I do not know if you have recently been to Karachi or Lahore. It is true that about 10 years ago the air in Karachi and Lahore was quite toxic, mostly due to diesel buses and 2-stroke motor-bikes and auto-rickshaws. That has all changed due to the use of CNG in literally all vehicles. Pakistan now has the largest number of CNG vehicles in the world - period. The air quality in Karachi is exceptionally good, thanks to all commercial vehicles' use of CNG and the continuous sea breeze. Lahore and other Punjab cities also have reduced pollution, but in the winter, they burn a lot of wood and coal, though not as much as they used to since now they burn natural gas. What that has done is to remove: sulfur dioxide (SO2); ozone (O3); nitrogen dioxide(NO2); Hydrogen Sulfide; and Ammonia. Clearly where combustion is, CO2 will be there, but with CNG, the days of CO carbon monoxide are also gone. The particulates, such as carbon soot are is also gone. So - some idiot in the World Economic Forum must have pulled this data out of thin air, likely with bias against Pakistan. Apparently, no new studies have been undertaken.. If you want to publish accurate result, then have someone at PCSIR or Karachi University run some tests - just send them air quality analyzers that cost under $10,000. Shams: "I do not know if you have recently been to Karachi or Lahore. It is true that about 10 years ago the air in Karachi and Lahore was quite toxic, mostly due to diesel buses and 2-stroke motor-bikes and auto-rickshaws. That has all changed due to the use of CNG in literally all vehicles...."
I agree with you that world's largest fleet of CNG vehicles is helping, and the air pollution situation would be a lot worse if natural gas was not the primary fuel used for energy in Pakistan. The situation in Pakistan would probably be as bad as India if Pakistan relied on burning dirty fossil fuels like coal. However, the problem of air pollution from particulates in major Pakistani cities is still quite acute, and obviously visible to the naked eye. During my travel to Dubai, Karachi and Beijing in 2009, I saw that Karachi was about as bad as Dubai and Beijing in terms of a constant layer of haze that hung over it during summer.
" As India, Pakistan and other developing nations vie for foreign direct investments by multi-national companies seeking to set up "
Pak == India in FDI. Pls mention the names of American companies who have invested in pakistan. Mukund: "Pls mention the names of American companies who have invested in pakistan." There are over 300 foreign multinational companies, including American companies, with operations in Pakistan. And more are coming every year in spite of economic slowdown. Almost all big name American and European companies operate in Pakistan. U.S. firms have a strong presence in Pakistan. More than 70 wholly-owned U.S. subsidiaries are registered with the American Business Council (ABC) and American Business Forum (ABF) in Pakistan. There are also hundreds of local firms representing U.S. firms in the market. Leading U.S. businesses in Pakistan include Citibank, Pepsi-Cola, Coca-Cola, Procter & Gamble, NCR, Teradata, Pfizer, Abbot, Eli Lilly, Wyeth, DuPont, Oracle, Microsoft, Cisco, Intel, Chevron, 3M, IBM, Apple, Monsanto, McDonald’s, KFC, Pizza Hut, Dominoes Pizza, and Caterpillar. Despite security challenges and common emerging market concerns about intellectual property rights (IPR) protection, contract enforcement, and governance issues, the Pakistan market offers many attractive trade and investment opportunities in a broad range of sectors: among others, energy (power generation); transportation (aerospace and railways); information and communications technology; architecture, construction, and engineering; health; environmental technology; agricultural technology; safety and security; franchising; and services. India has the worst air pollution in the entire world, beating China, Pakistan, Nepal and Bangladesh, according to a study released during this year’s World Economic Forum in Davos. When it comes to overall environment, India ranked among the world’s “Worst Performers,” at No. 125 out of the 132 nations, beating only Kuwait, Yemen, South Africa, Kazakhstan, Uzbekistan, Turkmenistan and Iraq. Neighboring Pakistan, in contrast, ranked 120th and Bangladesh was listed as No. 115 on overall environment. The main culprit, Ms. Roychowdhury said, is the growing number of vehicles in India. While the country still has far fewer vehicles per capita than developed nations, India’s cars are more polluting, Ms. Roychowdhury said. Other air pollution experts also cite India’s reliance coal and polluting industries like brick-making that are located close to densely-populated areas. Emission standards are nearly “10 years behind European standards,” Ms. Roychowdhury said, and these standards are not legally enforceable, unlike in countries like the United States which has the Clean Air Act. India has an Air (Prevention and Control of Pollution) Act, 1981 which is supposed to be enforced by the Central Pollution Control Board. This act lacks teeth, Ms. Roychowdhury said. “We need to take big steps or the problem will overwhelm us,” she said. D. Saha, a scientist in the “Air Lab” at India’s Central Pollution Control Board said the study’s findings were not a matter of huge concern. “We should not compare our country with others,” Dr. Saha said. “India has a different terrain.” He cited seasonal rainfall, deserts and dusty conditions as being responsible for the particulate matter. “Can we put water sprinklers across the country?,” he asked. Particulate matter comes from boilers, thermal power plants and cars, as well, he said, but India would not have development if these activities were curbed, he said. “The diseases mentioned in the report are caused by many factors not just particulate matter, we are raising undue alarm,” Mr. Saha said. 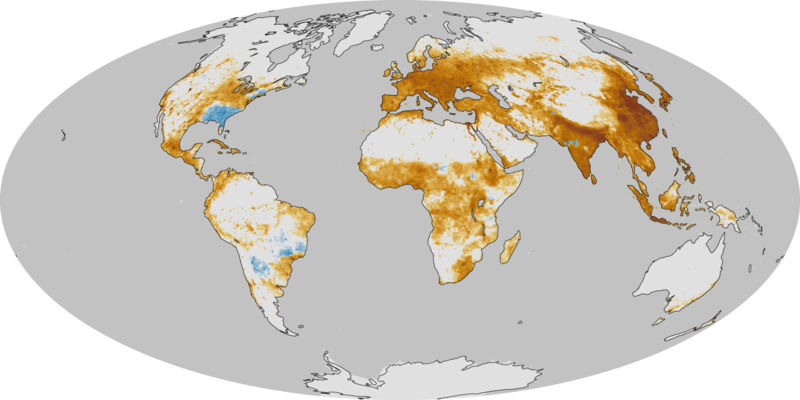 The United States space agency published a map in September that showed how rates of premature deaths from air pollution vary around the world. It indicated that northern China has one of the worst rates, attributed to the density of a deadly fine particulate matter, known as PM 2.5, that often results from coal burning. The map was based on data collected by a research team led by Jason West, an earth scientist at the University of North Carolina. Various recent studies and data suggest that air quality in Delhi is worse than in Beijing, though India’s air pollution problems do not get nearly as much attention on the world stage as those of Beijing. One study shows that Indians have the world’s weakest lungs. The World Health Organization says India has the world’s highest rate of death caused by chronic respiratory diseases, and it has more deaths from asthma than any other nation. Mr. Krishnan said in an interview that Delhi had been making the same kind of data available to the public well before Chinese officials agreed to release their numbers, and that the Indian numbers proved without a doubt that the air quality in the Indian capital was poor. However, he said, there has never in India been populist demand for the government to change policy to improve the air, as there is now in China. “I think when you have the sense that they’re hiding something, it galvanizes public attention in a counterintuitive way,” said Mr. Krishnan, who has lived in Beijing since early 2010. With India's population growth faster than poverty reduction rates, the absolute number of poor in India has gone up 5% since 1990.
" (British minister of international development) Alexander contrasted the rapid growth in China with India's economic success - highlighting government figures that showed the number of poor people had dropped in the one-party communist state by 70% since 1990 but had risen in the world's biggest democracy by 5%"
Proof of the grave air pollution problem confronting India is seen not just in the suffocating smog that on many days crowds out the sun in New Delhi, the world’s most polluted city. It can be measured as well in the fact that the country has the world’s highest death rate from chronic respiratory diseases, which kill an estimated 1.5 million Indians every year. 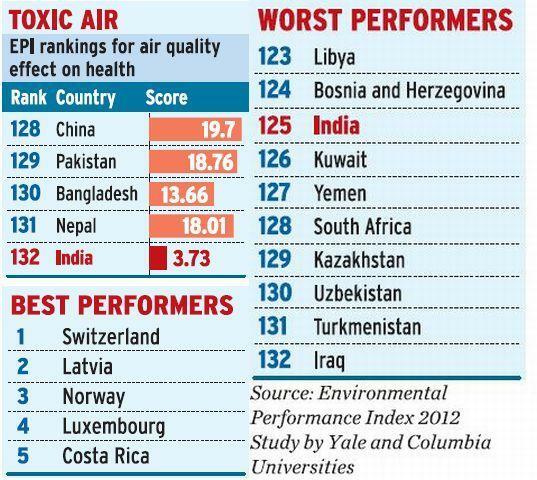 A 2014 World Health Organization report concluded of the 20 most polluted cities in the world, India has 13. After years of denial and indifference, ordinary Indians appear to be waking up to the dangers of relying on some of the dirtiest energy sources on the planet, including coal, diesel oil and burning garbage, to sustain economic growth and an exploding population. Yet the government has failed to address with any urgency what is indisputably a national health emergency. And it is more than just a national emergency. The unregulated use of these energy sources adds copious emissions of carbon dioxide, the main greenhouse gas responsible for the warming of the Earth’s atmosphere. So India’s inaction is a problem for everybody, not just its more than 1.2 billion people. World leaders are now preparing for a global summit on climate change in Paris in December, where they hope to agree on a global strategy. There have been positive gestures. Three months ago, the United States and China announced a breakthrough deal in which the Americans agreed to new emissions reductions and the Chinese agreed to a date when their emissions would peak. The European Union has made an ambitious pledge to reduce emissions by 40 percent from 1990 levels by 2030. As the world’s third-largest emitter of greenhouse gases, India also needs to make a similarly strong commitment to keep the momentum going — not just because its own emissions are large (about 5 percent of the world’s total as of 2011) but because India often speaks for the developing world, and the example it sets will be crucial. President Obama and Prime Minister Narendra Modi of India made only modest progress on climate change during their summit in New Delhi last month. Although Mr. Modi said he would make a positive contribution in Paris, there was no specific pledge to cut carbon emissions. Later one of his advisers told The Times that India is hoping to cut a side deal in Paris that would ensure India has “exemptions” from whatever broader agreement is reached. The notion of some kind of carve-out is not at all encouraging. As Michael Bloomberg, the former New York mayor and now the United Nations envoy for climate change and cities, argued on a visit to New Delhi last week, the notion of a choice between economic development and environmental quality is a false one because “if you don’t focus on the environmental quality you will not be able to fix the economic side.” Therein lies a message for India. Mounting evidence that India's poor air quality is cutting short lives is increasing pressure on the government to speed up corrective measures. The latest pointer to the magnitude of the problem is a study by environmental economists from University of Chicago, Harvard, and Yale. Their report, published on Saturday, says that 99.5% of the Indian population breathes air that has pollutants way above the levels considered to be safe by the World Health Organisation.